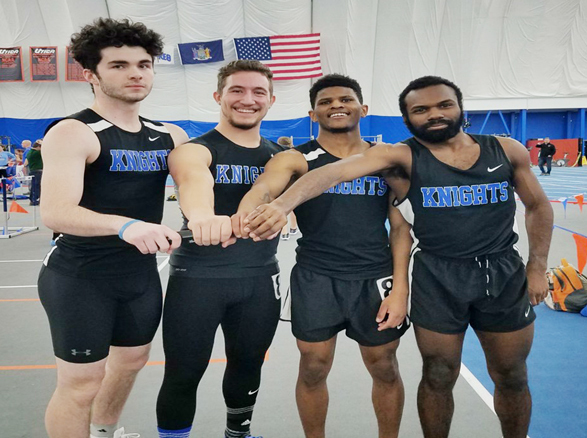 The Men's squad had a record setting day with the 4x200 relay team and senior Peter Zecchin setting new school records for the Knights. UTICA – The Mount Saint Mary College Men’s and Women’s Track and Field teams returned to action on Saturday at the Utica Invitational. The Men’s squad had a record setting day with the 4×200 relay team and senior Peter Zecchin setting new school records for the Knights. In the first race of the day the men’s 4×200-meter relay team shattered the school record, recording a new best time of 1:33.99 while also finishing second overall in the race. Isaiah Bevans-Didymus, Jahnique Dessaline, Nick Murphy and John Novak also hit the standard for the ECAC championship on March 1. The group is the first relay team to hit the standard in the men’s track program history. Zecchin continued his standout career for the Knights in the field events and improved his school record in the men’s shot put. He qualified for finals in the event, finishing eighth overall at 12.69 meters. On the track, Kenneth Barrett was eighth in the 1,000-meter run with a time of 2:45.87, just missing the school record by less than a second. Dabien Walker had a big day in the field finishing third overall in the Long jump at 6.44 meters and sixth overall in the High Jump at 1.83 meters. Valerie Lupi had a personal best in the women’s weight throw at 9.81 meters, Alexis Papadopoulos was the top mount female in the 60-meter dash with a personal best time of 9.11 seconds and in the 200-meter dash of with a new personal best time of 30.09 seconds. Alexandra Bergen had a strong day for the Knights and was the top runner in the 800-meter run, while Diamond Umunna was the mounts top female in the women’s mile. Next up for the Mount is a return trip to Yale for the Giegengack Invitational on February 9.